Sorry, Republicans — Scott Walker is not the man you think he is. Despite the 2016 candidate and Wisconsin governor's insistence that he's just your average American, someone who's ready to listen to the little guy and take the country back to its patriotic roots, his own resume proves otherwise. In fact, for someone who claims to be a Washington outsider, Scott Walker is embedded pretty deeply in the tangled political undergrowth. Most of the Wisconsin residents who remember him from his early days at Marquette University and later, as Milwaukee County Executive, have painted him more accurately as someone with deep political roots, ambitious enough to take on partisan agendas as early as his freshman year of college. "Walker enrolled at Marquette in the fall of 1986, a year in which he already was active volunteering for Tommy Thompson's successful GOP gubernatorial campaign," wrote PolitiFact of the former College Republican in 2013. "In February 1988, as a sophomore, Walker entered a fiercely fought campaign for Marquette student government president, running on a 19-item resume that ended with Eagle Scout." Unfortunately for Walker, who was allegedly caught sabotaging his rival's campaign and was later docked a day of campaigning due to multiple rules violations (in his defense, Walker's rival John Quigley was also punished for similar campaign violations), the opposing campaign painted him believably enough as an "incumbent" bent on raising student fees that the student body bought it, costing Walker the election by a wide margin. After a brief stint in the private sector, working with the American Red Cross and IBM, 22-year-old Walker again decided to try his hand at politics, first jumping in the 1990 race for the Wisconsin State Assembly against incumbent Democratic Rep. Gwen Moore of Milwaukee, which he lost, and later taking an Assembly seat from the Wauwatosa district in 1993 on a platform of welfare reform and reduced government spending. "He told me in the beginning [of our marriage] that he was getting ready to run for the state Assembly," Walker's wife Tonette told the Milwaukee Journal Sentinel in 2010. Immediately, Tonette Walker sensed an oncoming clash of ideas between her new husband and her parents, who were "Democrats and ... union workers" — a sticky topic that would come up again later in his political career when, as governor of Wisconsin, he would slash public union benefits and later move on to private sector ones as well. During his tenure with the State Assembly, Walker took on a number of controversial legislative and personnel issues, including one case that much of the current Walker campaign is either unaware of or has chosen to ignore. While working in the Assembly's Corrections and Courts Committee in 2002, Walker and a fellow colleague pushed for a recently hired maximum security prison chaplain, Rev. Jamyi Witch, to be tossed from her position due to the fact that she was a Wiccan. "Witch's hiring raises both personal and political concerns," said Walker in a statement that year. "Not only does she practice a different religion than most of the inmates she practices a religion that actually offends people of many other faiths, including Christians, Muslims and Jews." Walker's colleague, Republican Rep. Mike Huebsch, added that Witch's hiring was a "burden on the taxpayers," despite the fact that Witch herself had insisted she ministered as a "nondenominational" representative at the prison. (Witch was later charged in 2011 on various counts of "second-degree sexual assault by correctional staff," "delivery of schedule I or II narcotics," and "delivering illegal articles to an inmate," but that's an entirely different story altogether.) For someone who as recently as July 2015 defended legislation that protected religious liberty from government intrusion, it was a strange decision. Walker's tenure as a Wisconsin Assembly representative was a bumpy one to be sure. One year earlier, Walker defended a bill that would have protected pharmaceutical workers who refused to fill prescriptions for emergency contraception on moral grounds; during that same period, he also rolled out a hardened stance on the topic of voter IDs as well, but the accompanying legislation he had put forward was never signed into law. In 2002, Walker decided to try his hand at a more controlling role, running for and eventually winning a recalled seat as Milwaukee County Executive. Two years later, Walker again found himself mired in controversy after it was discovered he had made up significant facts in a negative campaign ad against his then-opponent David Riemer, who now works as a senior fellow at the Community Advocates Public Policy Institute. The ad in question was first investigated by the Milwaukee Journal Sentinel, to whom Walker later admitted the falsification, saying the "the ad's assertion" that Riemer had concocted a series of pension lawsuits that had cost taxpayers "millions" was "not correct as stated." 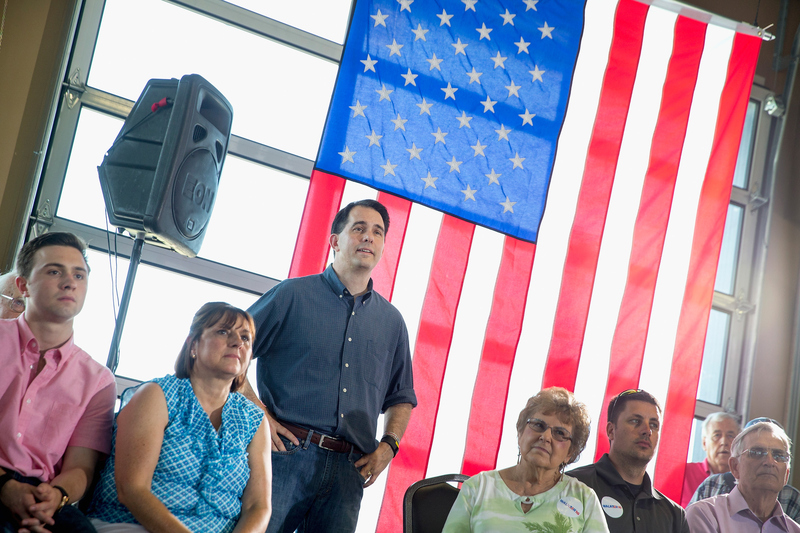 Walker's camp allegedly refused to pull the ad. Since being elected to the Wisconsin gubernatorial seat in 2010, Walker's political life has largely been an open book, especially in the past few months as he has kicked his run for the White House into high gear. The New York Times, quoting political journalist Dan Kaufman, has asserted that his controversial "union-busting" positions were an "early audition" for conservative billionaire brothers Charles and David Koch, who supposedly promised at least a portion of their $900 million budget for the 2016 election cycle to Walker's campaign. His debate performance in August was lackluster, but he still managed to hang onto a middle seat in the polls. So far, Walker's 2016 campaign has been uninspiring, but even-handed, with his commentary on the recent Chinese market crash on Monday giving him a slight boost in the media. For all the criticisms levied against him, Walker has survived thus far and will likely keep on his toes long enough to withstand the brutal Republican primaries. Just don't let him fool you into thinking he's never done it before.